Seventy million American homes and businesses burn natural gas, oil, or propane on-site to heat their space and water, generating 560 million tons of carbon dioxide each year—one-tenth of total US emissions. But now, we have the opportunity to meet nearly all our buildings’ energy needs with electricity from an increasingly low-carbon electric grid, eliminating direct fossil fuel use in buildings and making obsolete much of the gas distribution system—along with its costs and safety challenges. Reaching “deep decarbonization” goals of 75 percent or greater reduction in greenhouse gas emissions will require eliminating most of the CO2 produced by furnaces and water heaters across the country, alongside other measures across the economy. Further, electric space and water heating can be intelligently managed to shift energy consumption in time, aiding the cost-effective integration of large amounts of renewable energy onto the grid. Achieving this vision will require massive market transformation, including discontinuing the expansion of the gas distribution system, widespread adoption of new appliances in homes and businesses across the country, and new markets for intelligent devices to provide flexible demand to the grid. Eleven million households burn oil or propane for heat—the most carbon-intensive and costly fuels—and another 56 million burn natural gas. The most efficient electric devices, heat pumps for space and water heating, have small market share today. Many homes need additional electrical work to accommodate them, and consumer awareness of this heating technology option is low. However, for many existing homes currently heated with natural gas, converting to electric heat pumps for space and water heating will increase customer costs at today’s prices. 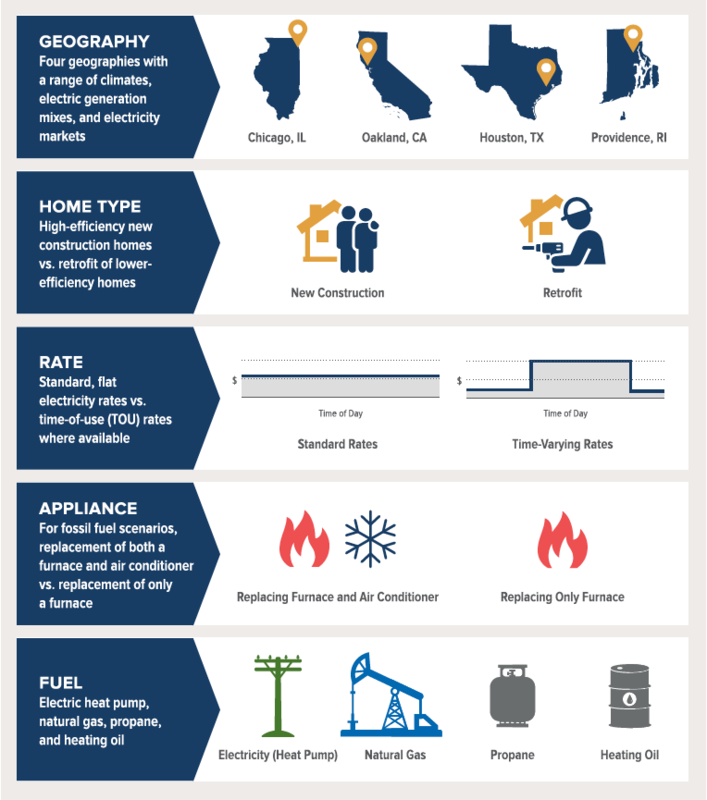 Customers with existing gas service face higher up-front costs to retrofit to electric space and water heating than to install new gas devices, and either pay more for energy with electric devices—generally in colder climates—or save too little in energy costs to make up the additional capital cost. The figure below illustrates these results across several scenarios. 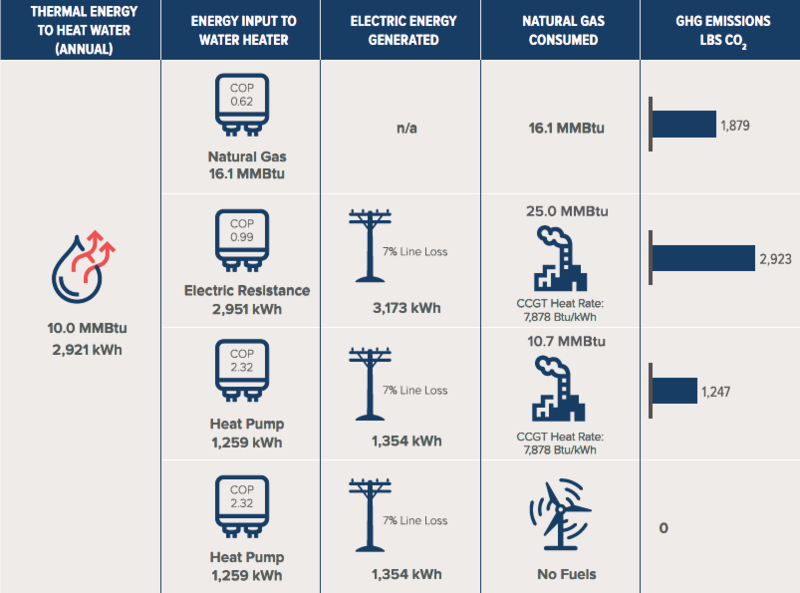 Many factors could improve the cost-effectiveness of electrifying space and water heating compared with gas in the future. The price of heat pumps is expected to decline as the market grows and manufacturers realize economies of scale. 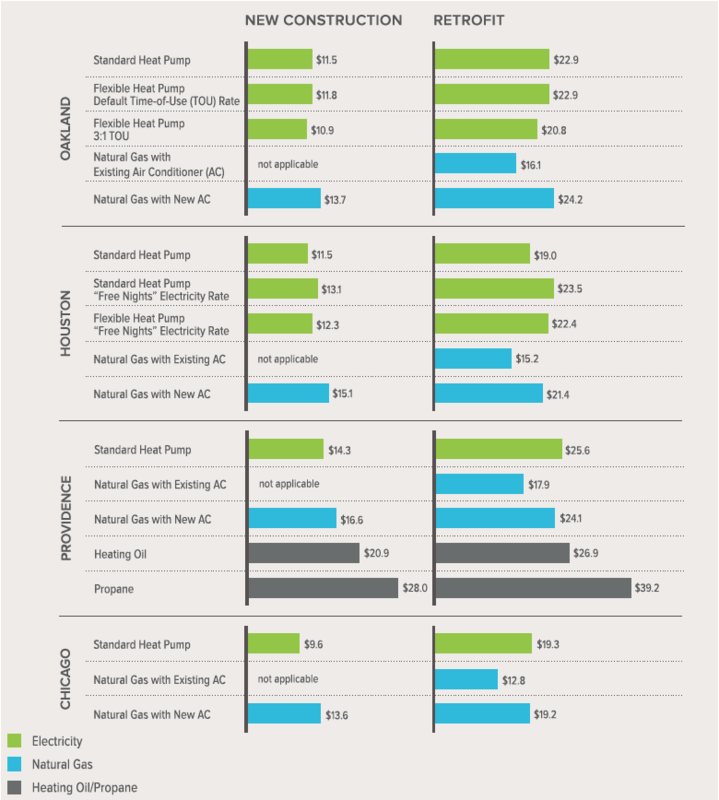 The value of electric demand flexibility is likely to increase as the share of variable renewables grows on the electric system—customers’ ability to capture this value with intelligent devices can reduce the lifetime costs of electrification but depends on new market structures, rate designs, and utility programs. Carbon pricing or other climate policies may impose additional costs on natural gas supply. Or gas commodity prices may rise in the future. Electrifying space and water heating already reduces carbon with today’s electric grid in all but the most coal-heavy systems. Even in a grid powered exclusively by natural gas, electrification would reduce carbon emissions relative to gas appliances in the home. With a renewable electric system, carbon emissions from electric space and water heating go to zero. In places like Oakland, Houston, and Providence, the electric grid is already low-carbon enough to offer emissions reductions from electrification. Even in places like Chicago, where coal often remains the marginal generator today, continued retirement of coal plants is likely to make electrification the low-carbon option over the long term. Prioritize rapid electrification of buildings currently using propane and heating oil in space and water heating. Although these represent less than 10 percent of US households, they account for more than 20 percent of space and water heating emissions. Electrification is very cost-effective for propane customers, and has a cost comparable to that of heating oil, depending on local pricing. Electrifying these homes in the near term can build scale and market maturity to support even more widespread electrification in the future. Expand demand flexibility options for existing electric space and water heating loads. Only 1 percent of the 50 million existing electric water heaters in the US participate in demand response. As widespread electrification adds loads, particularly in winter, effective demand management will mitigate system costs and aid renewables integration.